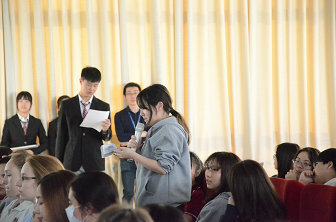 On May 7th, the students and teachers of the internationaldepartment of Beijing No.80 high school attended the presentation of socialpractice and the midterm-commendation congress in the lecture hall. In thismeeting, the student representative gave presentation of social practice andthe students who did well in the mid-term examination were also awarded. 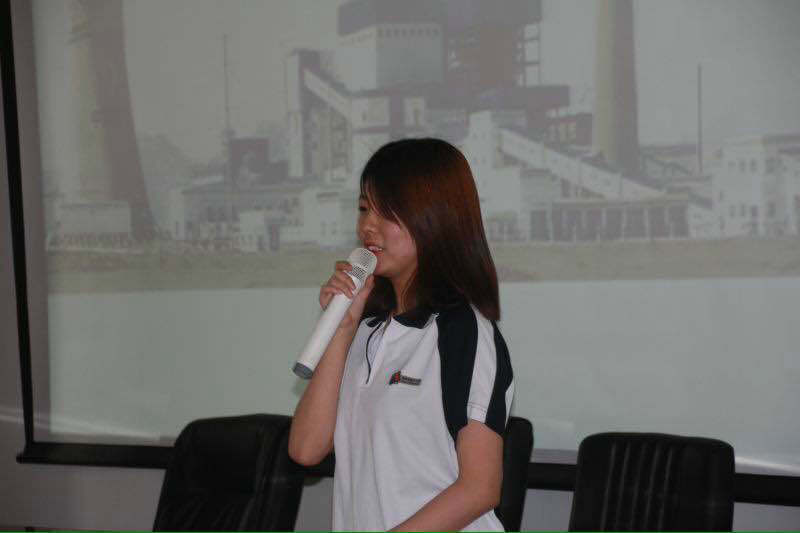 Jiang Caoyuan from 11-C1 presented her experience at BeijingElectric Power Corporation. She depicted the history of the corporation andshowed the way in which the corporation works. She also described her impression of the park and the surprise theextensive service area of the corporation brought her. "By participatingin this activity, I witnessed the efforts of the Beijing Electric PowerCorporation, the fulcrum of the power supply in Beijing. I realized howimportant saving up electricity is." Jiang Cao yuan said. 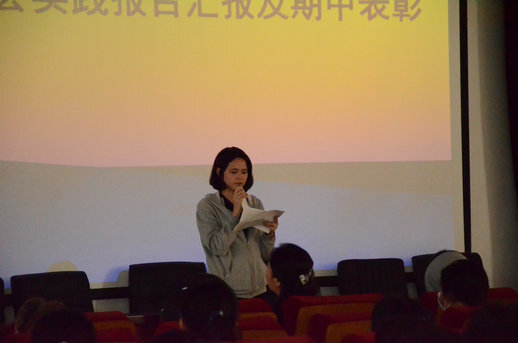 Then, Mei Yiran from 10-B1 showed her experience of visiting themuseum of Long Hui wine in front of all teachers and students . As a localbrand in Beijing, Long Hui not only has its history, but also has a goodinternational reputation. 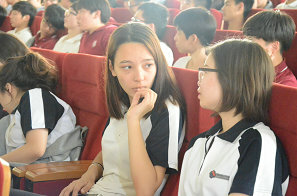 Besides the unique history and the value of Long Huibrand, students in Mei Yiran’s group mainly introduced the process of making wine. Moreover, MeiYiran said that the final activity, tasting different kinds of wine under thesommeliers' guidance, is unforgettable . 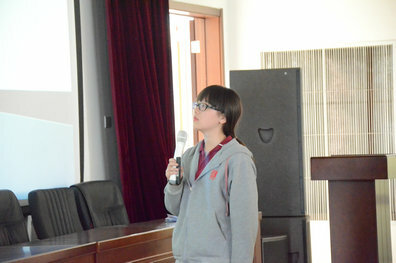 Finally,Maria from 10-C2 shared her experience of visiting Gaobeidian sewage treatmentplant. The advanced techniques of the sewage treatment as well as the workers’ conscientiousnessimpressed her so much. In addition, students also raised their awareness ofenvironmental protection through this social practice. “I was really astonishedby these complex sewage treatment process. I hope everyone efforts to savewater.” She said. Allstudents' presentations were vivid and meaningful. Their achievements and growthcould be seen in their wonderful show. Inthe midterm-commendation congress, Cui Weimin, the director of theInternational Department, read out the list of midterm award winners, includingachievers of learning progress, outstanding social practicers and activecontributors. They were Che Yanxiong from 10-C3, Li Mu from M3, Gangbu Linglifrom 10-C1, and Wang Xiaonan from 10-B1. 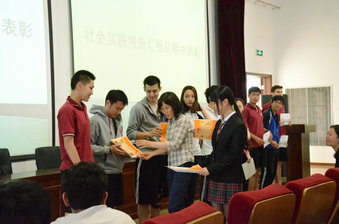 Teacher Huang Shulan presented the certificatesto these winners. At the end of the congress, Cui Weimincommented on students' in-class and after-class performances in this half-term.She highly appreciated the performance of students during the meeting, andexpected further progress of the students. Attending the meeting, a studentpointed out that the presentations gave him some profound insights intodifferent companies, while the commendation congress helped him recognize hisweakness. He said that he would improve himself to meet a new challenge.